A tastefully decorated property in a residential complex, situated on the coast midway Catania and Taormina, 500 meters from Santa Tecla, a quiet seaside village. The panoramic view from the spacious terrace of Casa degli Ulivi is a spectacle: you will see the dark green of the coastal hillside as well as the top of Mount Etna, the bay of Santa Tecla and the coastal cliffs called La Timpa. Casa degli Ulivi has two bedrooms with double beds and air conditioning, two bathrooms with toilet, bidet and shower, a living room with kitchen, sitting area, dining table and TV. From the panoramic terrace, a staircase leads to the private garden comprising a lawn with some olive trees. This is ideal for sunbathing or for children to play. The pool is open from early April to the end of October and measures 10x5 meters and is from 1 to 2 meters deep. There is wireless adsl internet. During summer, the locals visit Santa Tecla for the pebble beach at 400 meters from the village center and take a swim from one of the many solariums that are installed on the lava rocks. Santa Tecla has a small port, a village square at the seaside with an ice-cream shop, a bar, various pizzerias and two excellent seafood restaurants. For example the renamed and affordable seafood restaurant 'La Bettola dei Marinai'. We have been with Homeaway since 2006, proposing houses that are able to unfold Sicily's colours and charm at best. Houses with quality furnishing in unique locations, with incredible views or with a pool, always accurately selected in order to satisfy our main wish: to see you falling in love with Sicily just like we did. We provide you with transparent information and true pictures. What you see is exactly what you get. We will advise you as much as we can about travel info, transfers and car rental. Dinners in villas and other extra services can also be arranged. Finally, our prices are final rates! There are no hidden additional costs. We are flexible with your arrivals and departures and if you need a late check-in this is usually possible. The pool is open from early April to the end of October and measures 10x5 meters and is from 1 to 2 meters deep. Beautiful house with stunning views of Etna. Lovely pool area and on the whole very clean. Elvira is a fantastic host who can’t do enough for you. Would highly recommend this property. Lovely apartment. Great views overlooking Mount Etna. There was no pull out bed, despite the website saying there was, so wouldn't recommend for a family of 4 including children, unless your children don't mind sharing a bed (ours not keen!!!). However, the apartment was lovely; we enjoyed a week of beautiful weather, sightseeing and visiting the beach and using the pool. The flat's main features for us are its amazing view over Etna from the balcony, but also the peace and calm at the place, with the wave noises, the birds, the sounds from the open sky church. The decor is OK but not modern. The bids were very comfortable and the air con units very efficient. The little garden nearby was all ours. The swimming pool is very nice and the gardens around it beautiful. Some of the points that could do with improving but did not damage the experience of our stay include: when guests are in the flat above it can be a bit noisy, there was a problem of smell, when it rained, from the smallest bathroom, but also the fact that the kitchen could do with more utensils, pans, as we like cooking a lot. Residence is lovely, the views of Mount Etna and the surrounding area just stunning. Lovely swimming pool, owner and her employee are so helpful. 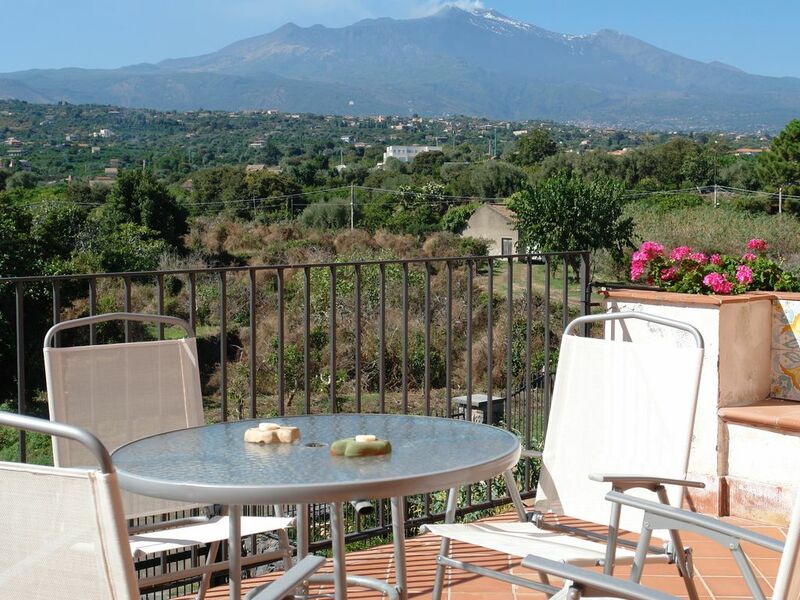 Nicely presented apartment with good outdoor space comprising of balcony with great views of Etna, which was unusually active during our stay, and private and secluded garden area. The shared pool was in a pleasant enclosed area but very small and only really viable to have a swim if no other residents were using it at the same time. The location of the property was good, within easy walking distance of a small local town. A 20-30 minute walk up the hill took you to another small town, Spazzo, which has a couple of pizza restaurants and more of a holiday feel about it.. Local beaches were not particularly appealing. Directions to the apartment could have been clearer. During out visit Antony was mostly available on site and was extremely helpful in providing information and advice on the local area, and recommendations for excursions, restaurants, etc. Our main problem with the apartment itself was that we were unable to use one of the 2 bathrooms during our stay due to an unpleasant smell coming up through the shower from a shared drain and which we only solved by keeping the door permanently shut to stop it from drifting into the main living area and blocking the bottom of the door with a towel. This was reported to Antony and Elvira who immediately attempted to address the problem, but unfortunately not successfully. Only other concern was the lack of soundproofing and resultant noise from neighbouring apartments. Great location, within walking distance of a lovely friendly local village. Superb fish restaurants, and bakery. Apartment very clean, and comfy beds. Well equipped for what we needed, and extremely welcoming service from Elvira. She made us feel as though we were the only ones staying in the residences. Pool most welcome, when we tired of the views of Mt Etna. Good central area with easy access to Mt Etna, Taormina and other beaches. The showers could do with some updating (curtains and not very well fixed rails) but it was nothing to spoil our excellent weeks stay. Directions to the property were spot on! Santa Tecla is an excellent base from which to explore eastern Sicily. The quaint fishing village lies halfway between Catania and Taormina and just three kilometres from Acireale, a pretty little city, built on a plateau of lava, that is known for its Baroque churches. Giardini Naxos, a seaside resort with beautiful sandy beaches, is just 20 kilometres from Santa Tecla. Beside it we find Taormina ‘the pearl of the Mediterranean’ and the most exclusive seaside resort in Sicily. Its ancient Greek theatre is world famous for its extraordinary panoramic views. Santa Maria la Scala and Aci Trezza are pleasant seaside villages near Santa Tecla. Travelling south, one hour’s drive away lies Syracuse. Santa Tecla is also an excellent base from which to explore Mount Etna and its surroundings. The villages of Etna, such as Trecastagni, Zafferana Etnea and Randazzo, are famous for their ancient lava flows, the architecture of their seventeenth century churches, their delicious local produce and the hospitality of the villagers. Situated 700 metres above sea level, they are a favourite retreat of the city dwellers who, in summer are in search of cool, fresh air, while in winter are in search of snow for skiing. Few people are aware that Etna is a popular location for skiers in winter. On some glorious days in winter, it’s even possible to ski the frozen slopes in the morning enjoying a wonderful panoramic view of the Mediterranean, and then, the same afternoon, go and sunbathe on the beaches below!